As the Enterprise approaches a Class M planet, Pollux IV, during a survey mission, something strange and frightening occurs. 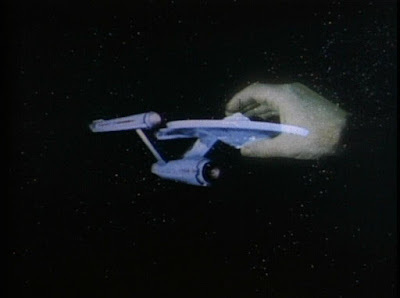 A giant green hand, composed entirely of energy, snares the ship in a trap. Captain Kirk (William Shatner) soon learns that he and his crew are prisoners of the Greek God, Apollo (Michael Forest). Apollo and his fellow Gods were actually space travelers who visited Earth 5,000 years earlier and were mistaken for deities by the primitive human beings of the time. Apollo orders Kirk to beam down and attend him, but leave Spock (Leonard Nimoy) -- who reminds him of Pan -- on board the starship. Kirk complies, and he transports down with Dr. McCoy (DeForest Kelley), Chief Engineer Scott (James Doohan), Ensign Pavel Chekov (Walter Koenig) and “A & A” (Anthropology and Ancient Civilizations) officer Carolyn Palamas (Leslie Parrish). As for the remainder of the crew, Apollo plans for them to spend the rest of their days worshipping him. He thrives, in fact, on such worship and adoration. Kirk refuses to “bend knee” and Apollo demonstrates his power. He is able to hurl lightning bolts like the mythical Zeus, and growing to gigantic proportions. While Spock and Uhura (Nichelle Nichols) attempt to find a way to punch a hole through the force field created by Apollo, Kirk must convince Palamas to spurn Apollo, even though she has fallen in love with him. 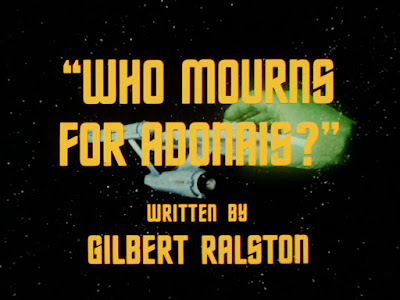 On first blush, “Who Mourns for Adonais” feels like a very formulaic episode of Star Trek (1966-1969). We have already seen the Enterprise crew grapple with a God-like being on several occasions, in “Charlie X,” “Where No Man has Gone Before,” and “The Squire of Gothos,” to cite three examples. 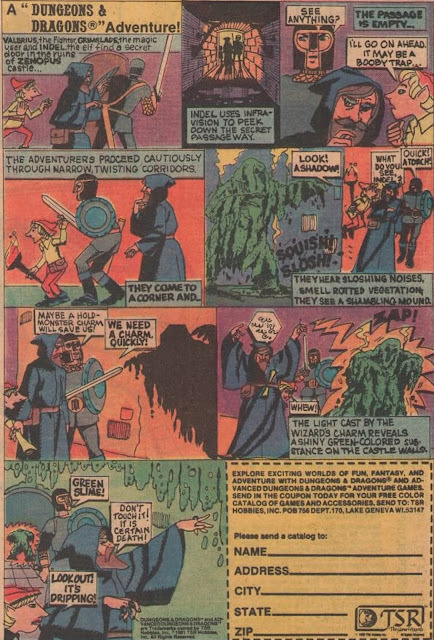 The Squire of Gothos” seems to be a major influencer, in particular, on this episode. There, as in here, the god-like opponent to the crew (Trelane/Apollo) does not like Spock, traps a landing party on a planet surface, and dresses a female crew-member (Yeoman Ross/Lt. Palamas) in an historical/period dress. In both stories, ship technology (transporter/vs. phasers) at Spock’s command plays a role in rescuing the stranded crew members. “Who Mourns for Adonais” also pipes in the Khan/McGiver romantic subplot from “Space Seed,” with yet another vulnerable female officer being forced to choose between her Starfleet duty and her romantic love for a charismatic, larger-than-life male. Once more, I would be hard-pressed to find an opposite example in Star Trek; an episode wherein a male officer succumbs to the charms of a charismatic female character and his loyalty (or lack thereof) threatens the crew. And why can’t Carolyn’s prospective husband be the one to leave his career? Why does it have to be her? In this way, and in comments like Apollo’s line “she seems wise…for a woman,” Star Trek is every bit 50 years old. I find it constantly baffling that Star Trek can be so forward thinking in so many ways, and yet still demonstrate such sexism towards females. Also, Scotty seems woefully out-of-character here, pining away for Carolyn Palamas. We all know he’d rather be reading his technical journals, right? Lastly, there is an element of “camp” creeping into the series here. Instead of a story with genuine science fiction concepts, “Who Mourns for Adonais” provides an opportunity to raid Greek myth, Greek architecture, and so forth -- even Greek drama, actually -- for its story. Lost in Space (1965-1968) often featured stories wherein the Robinsons, stranded on an alien world, encountered “types” from Earth history. They met police men, Western bandits, pirates, department store managers (! ), Arabian thieves, and so on. “Who Mourns for Adonais” threatens, in visual terms, to be of the same school. But Star Trek gets away with it because there is usually a reason for such Earth-types to appear (they are either space travelers, or from a parallel world). In other words, there is usually a real underpinning for the existence of such colorful Earth clichés. But here’s the rub. All the flaws I have named don’t ruin the episode in the slightest, and “Who Mourns for Adonais” works effectively because there is a genuine intellectual debate behind it, and an emotional context to that debate. In simple terms, “Who Mourns for Adonais” is about the never-ending battle between progress and tradition. On one side is Apollo, who believes that mankind has “lost something special” in the 5,000 years since he last saw them. He wants them to return to a simpler, more basic time. He is, in essence, the call of tradition, longing for a lost golden age. For Apollo, the age for which he longs is in which he is privileged as the unquestionable “God” of the people and worshiped as such. In that age, Gods such as he stood apart, and beyond others. They took mortals as wives, and these wives were not “officers” with “jobs” or “duty.” They wore dresses, not uniforms. On the other side of the equation is progress, represented by Kirk and the Enterprise crew. Kirk and his crew possess no desire to go back to a system which benefited Apollo, at their expense. They are not goat or sheep herders, and they don’t want to gather laurel leaves for a personality who is their equal…not their superior. Kirk and his crew want to chart their own destiny and be independent…free. In other words, Kirk and his crew are all about egalitarian modernity, which promises equal rights and sovereignty for all people. 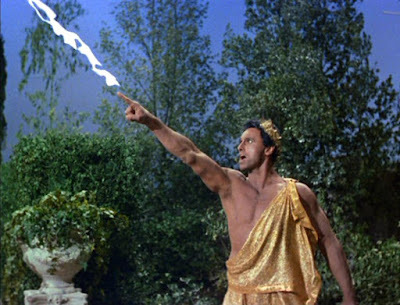 Kirk’s world is not about a return to nature and a Luddite life (represented by the gathering of laurel leaves…), or accept subjugation to an authority he no longer recognizes and has “outgrown.” His world is about pushing the edge of knowledge; self-direction and self-determination. Justice and self-determination for all. These two philosophies -- status quo/tradition vs progress -- come into direct conflict in “Who Mourns for Adonais.” And, of course, we know which philosophy wins. As Kirk understands, history only moves in one direction, ultimately. It moves forward. There are those who resist progress, and wish for a “golden age” (one usually based on myth…like Apollo’s very existence) to return. But it can’t return, for a lot of reasons. Conditions change. Technology changes. People change. Progress meets resistance, but progress always wins, even if there are setbacks along the way. Other episodes very much concern the idea of false or erroneous progress (consider the androids of Dr. Korby in “What are Little Girls Made of” or the M-5 in “The Ultimate Computer,”) but Star Trek almost never rejects true, human progress. 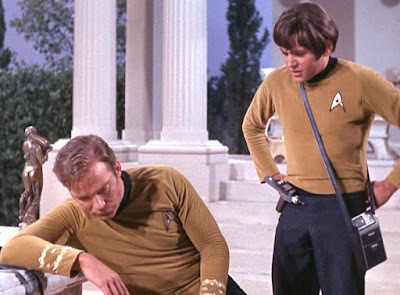 Kirk strikes a blow for progress and self-determination in “Who Mourns for Adonais,” but the spectacular quality about this episode is that he ultimately takes no joy in his victory. In the coda, McCoy wishes, aloud, that they had not had to take down Apollo. Kirk wonders if it would have hurt them to gather a “few laurel leaves,” simply to respect the tradition that, in a very real way, made Western civilization possible. This compassion for a former enemy, and a philosophy that doesn’t serve them, is a factor that distinguishes Star Trek from other space adventures. Kirk and McCoy can honor what Apollo was, and what he gave our culture, in context. But that doesn’t mean that he can win; or that they can accept his prescription for their lives (see: goat herders). Time eventually passes all ideas by, including Apollo’s. Humanity simply can’t go back to what it was, 5,000 years ago. Just like we, in America, can’t go back to what we were 60 years ago. We can have compassion for those who desire a return for that (mostly mythical “golden age”), and you can help them cope with change, but progress will not stop for them; any more than Kirk allows progress to stop because of his respect for Apollo, or the ancient Greeks. An appeal to tradition is, simply put, a logical fallacy. It says, simply, we should continue to do something because we have always done that thing. But knowledge does -- and must -- intervene in that thought-process. We learn new things, and we develop. And so we can’t relive or re-conjure the past, knowing what we now know. Sixty years ago, in film, pregnant women smoked and drank alcohol on-screen. Even in futuristic drama, women were treated in a sexist fashion. We know today, that there is a reason not to continue such behaviors. The chain of tradition, at some point, must be broken in the name of egalitarian justice, and knowledge, instead. That’s, finally, what “Who Mourns for Adonais” is all about. We can appreciate the past. But we will not relive it. This conclusion is not without pain. Carolyn hurts Apollo, the man he loves. And Apollo, in being spurned, realizes he has outlived his usefulness. He learns that, even as a near-God, he can’t re-conjure a past age, or past ethos. “Who Mourns for Adonais” is a glorious episode, in part because of the contradictory thoughts/emotions it raises. We definitely don’t want Apollo to succeed. And yet we never hate him. We always feel compassion for him. Kirk’s final line, wondering if they couldn’t have gathered, for their host a few laurel leaves, is perfect. It captures the tradition vs progress debate perfectly, and reminds us that there are, in this battle, unfortunate casualties. The march of progress cannot stop. But we can still honor our past, and the tradition that brought us to our current stage of development. Nailed it. They weaved a lot of pathos and melancholy into Adonis. And we do indeed feel sorry for him. Superb work from Michael Forest. It is interesting (and cringe inducing) to see a lot of the sexist attitudes woven through old television shows, especially one so forward thinking as Star Trek. I think the reason why the writers and producers were so blind to it was because I don't think they realized that it was actually demeaning. I can recall the news coverage of the Women's Liberation Movement in the early 70s where the male reporters seemed genuinely baffled by their cause. Why wouldn't women want to stay home and raise kids rather than deal with the rat race? Men simply didn't get it back then. Terrific analysis, John. I won't repeat any of your points. - The terrific opticals of the oversized Apollo. - Fred Steiner's great score. One of the best episodic tv scores ever. - The sense of drama: while on the surface this episode appears to stream unbridled melodrama, it actually is a fine fusion of affecting performances and story (themes). A few years ago I read an interview with actor Micheal Forest where he talked about his trip on Star Trek. The producers at first made calls to agencies in England in order to get a British actor. Forest auditioned for the role and the producers asked him if he could do a British accent, to which he responded with a simple "I could but it wouldn't be me". Micheal Forest was great in the role as Apollo. So affecting were the dramatics as Apollo gave his speech from the heart, that he and Leslie Parrish were actually crying. Watch Scotty, Kirk, and the rest in this scene. The acting is top drawer. Final note: Micheal Forest was so impressed with the temple set the designers and crew had constructed on the stage that he felt it helped his greater performance as Apollo. When he sat in his seat for the first time he felt right at home. 2) Kirk's line "We find the one [God] sufficient" sounds rather un-Roddenberry, leading some to think it was put there to appease the network. Heaven forbid the viewers extend the "we don't need you any more" argument to the predominant religion of the day! I think the clostest you might get to the male side of these episodes is "Elaan of Troyius". There, Kirk is able to fend off his (chemically-induced) infatuation, just as Palamas is able to do here, and as McGiver wasn't. But note one of the big things in this episode: it proves that the Greek gods did exist in ST's history. And so probably most of the myths surrounding them. JKM, I need to point out here that Kirk's line about Palamas' possibly marrying and leaving the service was much less sexist than it seems: it was written toward her eventual pregnancy! A sequence about her being pregnant by Apollo was filmed but cut, as was probably other material written toward that ending, while Kirk's line remained. Her character was probably intended to evince some ambivalence about remaining in Starfleet and a desire for a family which Apollo picked up on. Of course, one cannot be pregnant on a 5 year mission with the ship configuration as it was then . . . that would have to wait until over 80 years later when TNG had a much larger vessel and missions were designed to accommodate families on long voyages. Not much to add, except for the mention of this episode's giant green space hand in the recent Star Trek Beyond; not only is the green space hand referenced in Scotty's dialogue - it actually appears in the closing credits! Right after the actors' names, a gaseous green hand takes a swipe at the camera. I thought that was a really cool reference to include in the film - twice! !